If you have not handed in your histogram from the previous classes (see previous blogposts) AND interpretation (see the questions in the previous blogpost), do so. Make sure you have a copy in your digital science notebook and that your name and period are on the paper. See the cylinders where we collected carbon dioxide during the last class. We initiated a reaction between sodium hydrogen carbonate and acetic acid (5% in water = vinegar). The carbon dioxide was a product of the reaction. From the model demonstrated in class, where do you think the carbon dioxide came from: the vinegar, the baking soda, or both? 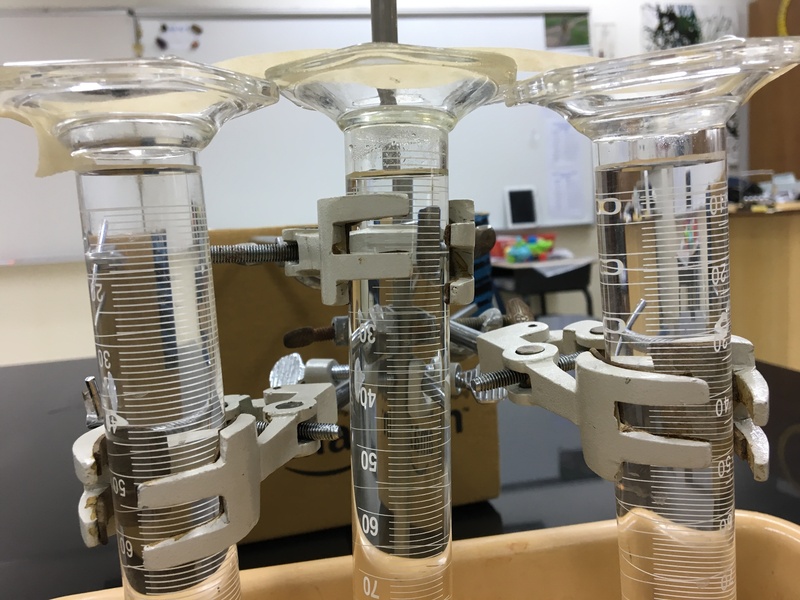 What explanation do you have for why the water has almost completely risen to the top of the cylinders? (Picture below). How could you test your explanation? Create a new folder in your DSN. Call it Earth Cycles. Your entry for this class spent thinking about Rivers and Water should be uploaded there. Click on the link below. Then click on poems. Then click on We Wash Our Bowls in this Water. Write a reflective response to the poem. It is about Water (of course) and has references and vocabulary related to rafting intertwined. It also has references to Asia and Asian landscapes. What does the poet suggest about the relation of water to landscape? What are the different ways the poet alludes to the significance of water? What is your experience with rivers? Describe the different rivers you have known? What do you anticipate about rafting on the Ganges during WOW 8? Do you know where you will be rafting? sleeping? eating? hanging out? What are the properties of water–at many scales? How do these properties determine the behavior and interaction of water with us? with the physical earth? with the living earth? with the entire earth system? What do you think the opening epigraph means: “The 1.5 billion cubic kilometers of water on the earth are split by photosynthesis and reconstituted once every two million years or so.” ? Questions: What part of Delhi is AES in? What part of India is AES in? Question: How does it compare to other trains you’ve taken? Question: Can you find the likely route from AES to the New Delhi Railway Station? How long in kilometers do you estimate the train ride to be? In which stations/cities/towns do you think the train will stop? At one point on the trip the train changes directions—if you were facing forward you will now face backwards and vice versa. Can you find the place where you think this will happen? What crops can you identify? What do you see people doing in the fields? What farm products do you see being transported on the roads? Do you have any connection with these products? You might be very fond of the crop being harvested in the picture. Any guesses? What wild and or domesticated animals do you expect to see along the way? 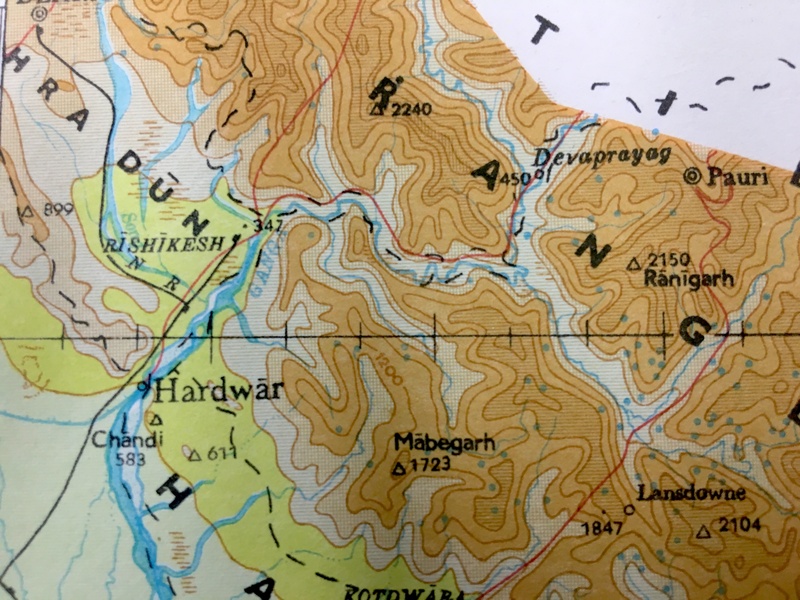 Notice the terrain changes from Haridwar into the foothills. What do you think the different colors on the map mean? What do you think the lines mean? <http://s.hswstatic.com/gif/how-to-read-topographic-map-2.jpg>. The high Himalaya are not shown on this section of map. How much higher do you think they get? Look at the segment of the Ganges shown. What direction is it flowing (of course it is flowing downhill), but what compass direction does it flow from point to point along the portion that is shown? Why do you think that happens? 8th graders will raft much of the section of river that you see in the map. Find out about the term: Watershed. Look at the aerial photo and try to trace the river down stream. Rapids are named on some of the areas when you zoom to a certain scale.